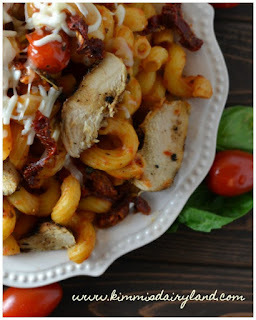 Sun dried tomatoes, fresh basil and shredded mozzarella are the icing on top of this Chicken Caprese Pasta. 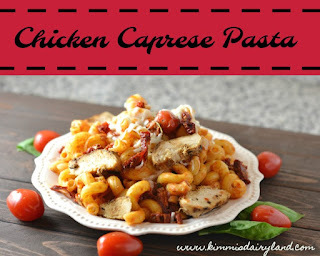 Depending on your preferences - and those of your family - you can easily add more chicken, more sun dried tomato or more/less of any ingredient you'd like! I love flexible recipes. Flexibility is important in the kitchen and also during busy times on the farm. Hay season is our busy time and corn silage season is a definite contender for that title. Here in Indiana, the combines are rolling and fall harvest is in full swing in most places. Fields of corn and soybeans that were planted in the fall have reached maturity and are ready for harvest. The green arm is unloading shelled corn from the combine into the grain cart. The combine can only hold so much. How do farmers know when the crops are ready? The easiest way to know is by measuring the moisture level. Shelling corn while it's testing 35% moisture is generally not the best idea in most cases since it will use more propane to dry down in the grain dryer, which is connected to the other grain bins in the grain system. It should be closer to 15%. It can become a race against the clock in some cases to get everything done. Having someone to prepare meals and keep everyone fed becomes the icing on the cake during these busy seasons when fast food can get old quick. 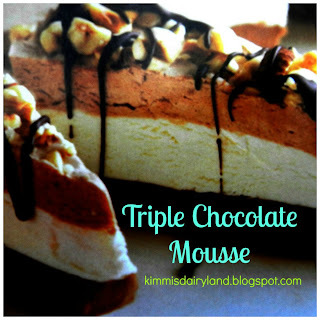 If you are looking for a chocolate dessert that you can easily transport to the fields or take along to work for lunch, you'll love my Triple Chocolate Mousse. Click here for the recipe. Absolutely love how simple this recipe is. I am a big big fan of pasta though I'm not sure if we have Cavatappi pasta here. Nevertheless the recipe seems really easy. You can substitute your favorite kind of pasta into this recipe. Enjoy! !